I wrote earlier about our first pitching competition. Yesterday was our second public presentation, this time to FIBAN, the Finnish Business Angels Network. This time the competition was tougher. A lot tougher. 10 companies had been preselected from 25 applicants based on the slide deck, and we were really honored to be in that lot. There were plenty of experienced pitchers from companies in accelerator phase, such as Responsive Ads who have cool HTML5 tech and feature Mashable as their client, the award winning Runteq, and also established companies with patent portfolios like Tamturbo. The selected companies each gave a 5 minute pitch, no questions were asked. Cramming all the relevant info to just 5 minutes was incredibly challenging for us, but in the presentation we reached the end just on time. In the end, the three best pitches were announced. We're really proud of our second place! 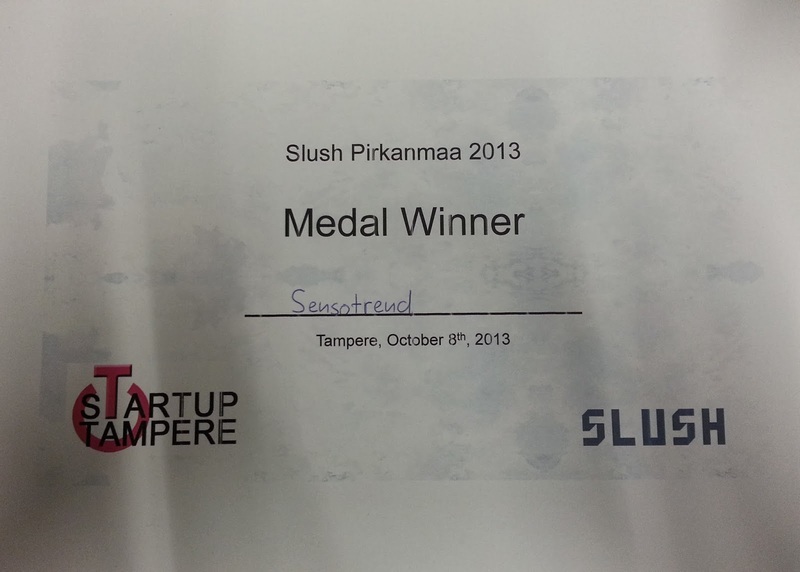 Tamturbo won the competition, the third place went to Jalava Sensors. Afterwards, there was some time for networking and closer discussions with interested angel investors. We got some good contacts and initiated some interesting discussions. We're hoping the discussions will result in us getting more help in putting the numbers in shape. Financial expertise is clearly our week spot at the moment.